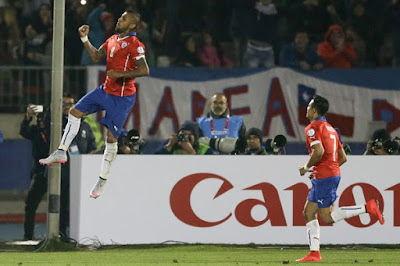 ARTURO Vidal scored a controversial penalty deep into injury time as holders Chile snatched a dramatic 2-1 victory over Bolivia to keep their Copa America Centenario campaign alive. Bayern Munich star Vidal struck from the spot in the 10th minute of time added on after a hugely debatable penalty was awarded against Bolivian defender Luis Gutierrez for handball by US referee Jair Marrufo. Television replays showed Gutierrez had his right arm behind his back to avoid conceding a handball but Alexis Sanchez’s cross struck him on the shoulder and Marrufo pointed to the spot after the apparent intervention of the linesman. Bolivia’s players surrounded the referee for angry protests but Marrufo’s decision stood and it was left to Vidal to drive home the penalty. 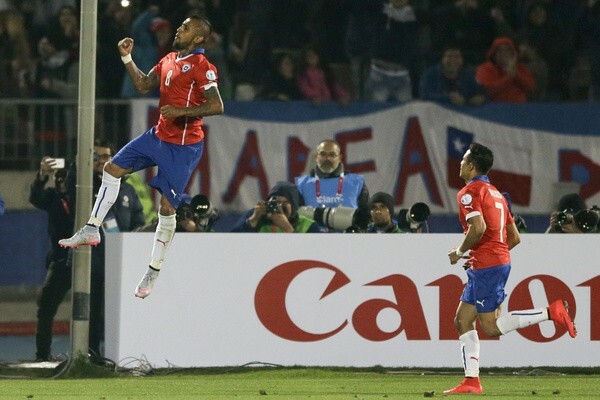 The result gives Chile hope of reaching the last eight following their opening defeat to Argentina in Group D.